Wooden Dowels Pins 1/4" x 1" Fluted Wooden 300 Pack. 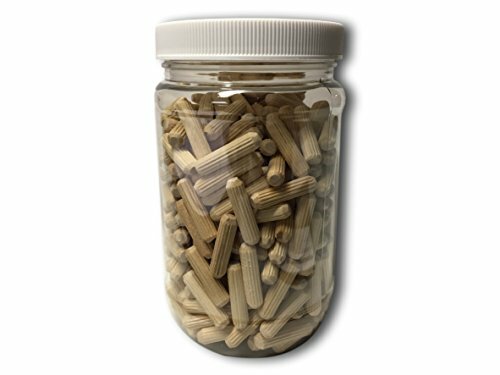 Wood Dowels are Kiln Dried Birch Wood with Flutes which Eliminate Trapped Air for Superior Fastening. Fluted pins also ensure even glue distribution. Made of Natural Hardwood Harvested responsibly to meet FSC standards. Natural Birch wood, Non Food Safe. Beveled Chamfered ends are essential not only making aligning simpler, but crucial in ensuring completion of hand made man made projects. Allows margin of error and compensates if measurements are slightly off. Made of Hardwood This product comes in a clear reusable jar with pressure sealed lid which eliminates moisture for easy storage and accessibility. DIY practical applications: furniture refurbishing or repairs , shelving, shelf replacement, cabinetry for repurposing cabinets, up-cycling, maintaining chairs, repairs etc... Some arts and crafts applications include: class room projects, party crafts, camp crafts, model building, doll house miniatures, for teachers, students and camp instructors Some education applications: academic tools, teachers supplies for grade school, pre-k pre-school, kindergarten to elementary, middle school to high school. math tools for counting cognitive learning. A great American product. 100% Money back guarantee if you're not completely satisfied. These Wood Dowels are Kiln Dried Birch Wood Pins with Flutes which Eliminate Trapped Air for Superior Fastening. Fluted pins also ensure even glue distribution. Made of Hardwood This product comes in a clear reusable jar with pressure sealed lid which eliminates moisture for easy storage and accessibility. If you have any questions about this product by RHINO INDUSTRIES, contact us by completing and submitting the form below. If you are looking for a specif part number, please include it with your message.